At pt Health, we have so many amazing, enthusiastic, and passionate people. For us, spotlights are a great chance to introduce these great team members and give them a platform to share what they love about their careers. 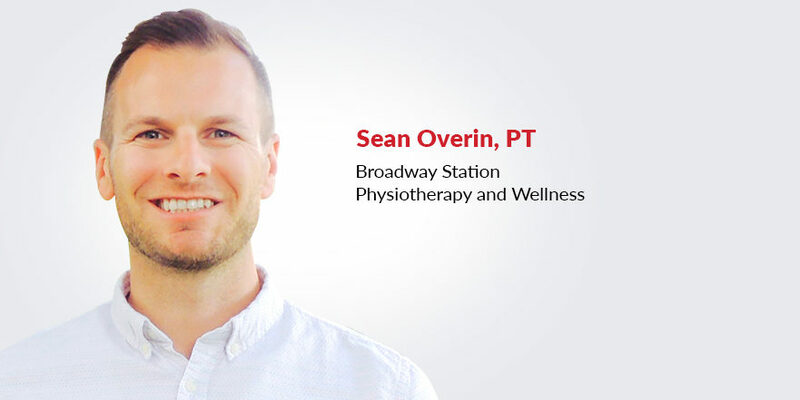 Today we’re getting to know Sean, a physiotherapist and Clinic Team Manager at Broadway Station Physiotherapy and Wellness, in Vancouver, British Columbia. Sean’s passion for learning is contagious, we’re sure you’ll feel his excitement and really get a feel for what it’s like to be a practicing physiotherapist and Clinic Team Manager. For each patient, my goal is to provide an honest, educational and client-centric experience. My approach takes into consideration the many facets of life that influence pain and movement while leveraging current evidence to provide the best possible outcomes for my patients. I enjoy treating a variety of conditions with a diverse set of manual therapy and exercise interventions, but have special interests in pain science, neck and low back disorders, cervicogenic and tension-type headaches, and upper extremity conditions. In addition to clinical practice, I am passionate about healthcare innovation and enjoy discussing, teaching, and challenging current practice trends based on the best available evidence. I am currently leading a team of talented healthcare practitioners at Broadway Station Wellness and Physiotherapy; together we work to keep British Columbians moving for life by delivering exceptional patient experiences. By the end of 2011, I completed my kinesiology degree and was searching for my first job out of university. At that time, a good friend of mine was working as a kinesiologist for pt Health. He was excited about the experience he was acquiring and the people he was working with and suggested I apply. So I decided to take his advice and was working as a kinesiologist before I knew it. Over the next year, I gained invaluable experience, knowledge, and clinical skills at pt Health. However, I was accepted into the UBC Physical Therapy program and left to complete my degree. During my PT training I stayed in touch with some of my mentors from pt Health, and when I was nearing my graduation, I was offered a position to work in Vancouver. I gladly accepted and started work as a contract physical therapist. A year later I decided to incorporate. A typical day starts with reading some physical therapy research, then I answer emails and attend to management related duties. After that, my clinical day begins, and I typically consult with 10 patients before lunch. After refueling, my clinical day continues with another 5-10 patients and finishes up by touching base with my clinical and administrative teams. After leaving the clinic, I am usually off to the gym or heading out for a run then racing home to relax to spend time with my wife and daughter. Two years as a kinesiologist and three and a half years as a physical therapist. One of my favourite clinical stories started with a busy clinical hour with three patients showing up all at the same time – one was early, and two were very late. Interestingly, all three patients had shoulder conditions on the same side! Knowing I could not get to all of them in that hour, I asked how they felt about doing a group exercise program since they were all in for a similar injury. After some initial banter and laughs, they all agreed to go with the plan, and I started by leading the session. Before I knew it, I was challenged by all three patients and started exercising alongside them over the next 40 minutes. It was a good hour of laughs and hard work, one which was likely to be memorable for all. I am a huge physical therapy nerd – for example, most mornings start by waking and getting to the clinic early so I can read physical therapy research. Beyond reading, I also need a weekly adrenaline rush and get my fix on the weekends tearing down Vancouver’s North Shore on my mountain bike. If you’re looking to work at a clinic that offers the opportunity for growth, check out our careers page for opportunities near you. Join the pt Health team!